They can’t get a decent job corresponding to their education and skills. It is very hard for them to start governmental or administrative job. They are not admitted to high positions in political circles. It is next to impossible for them to hold high positions in the Interior Ministry, Ministry of Defense or the National Security Agency. They are not admitted to managerial or administrative positions in large private companies (mainly owned by former communists) where salaries are higher. They can’t start a profitable business, because double standards are applied to people not connected with the former communists. They can’t get government contracts because the contests for these contracts are phony and arranged in advance. They cannot be competitive because they are subject to the full weight of the law, while the communists don’t get penalized for abuses and violations. The profitable business consists of companies close to the political circles that stifle small and medium businesses by imposing a monopoly and cartel arrangements. EU funding grants are acquired primarily by companies and people related to former communists. Full weight of the law is applied only to people not related to the communists. Despite the corruption in all areas in the government at the highest levels, there is no one convicted and imprisoned until now. Although politicians often have conflicts of interests, there is no consequence. Murders are committed by people related to the communists, but Justice let them leave the country to avoid law. 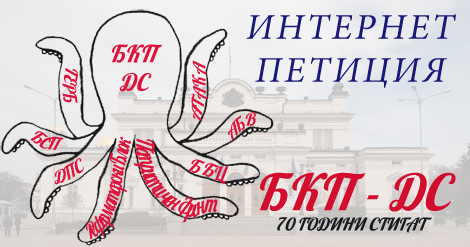 If you are a Bulgarian and feel you are discriminated against because you are not connected with former Communist Party, please sign the petition, share it in Facebook, or like the page so it can reach as many people as possible. According to Wikipedia, a part of the definition of discrimination concept is as follows: "... treatment or consideration of, or making a distinction in favor of or against, a person or thing based on the group, class, or category to which that person or thing belongs rather than on individual merit ..."
In the following paragraphs we will show that the people in Bulgaria who are not connected to the former communist party are discriminated against by the former communists and their descendants. It is known that in Bulgaria the members of the Communist Party around 1989 were roughly one million in a population of 9 million people (Demographics of Bulgaria). Assuming that the Communists were uniformly distributed among the Bulgarian population it can be calculated that the probability a Bulgarian born before 1989 to have at least one parent member of the communist party or she or he has been a member of that party is roughly 37%. The probability that a parent of a person born before 1989 has been in the communist party is about 1 / (5/7 * 9) ≈ 15%, assuming the population of legal age at the time was roughly 5/7 * 9 million. Hence the chance that a person IS NOT connected to the communists is approximately 38/45 * 38/45 * 8/9 ≈ 63%. However, it is no secret that in Bulgaria well above 50% of the people holding managerial or administrative positions or having profitable businesses are related the former Communist Party or its secret services, as it can be seen from this site. There is also the possibility that the people associated with the communist party are much more skilled than the rest of the population. However, considering that Bulgaria, under the leadership of those people is the poorest and one of the most corrupt countries in Europe, it can be concluded that the previous presumption is not true and it only proves the incompetence of these people. We should also not forget that most of their parents come from the lowest strata of the population before 1944, coming into power after killing and putting in concentration camps the Bulgarian elite. In countries like the US, there are policies called affirmative action, giving preference to people from groups that are considered to be discriminated against. In Bulgaria we observe the opposite phenomenon - people unrelated to the former communist party live in poverty or emigrate because of the inability to find a suitable job corresponding to their abilities or because they live in uncertainty due to the dysfunctional judicial system, protecting primarily the interests of the former communists. In the Western world it is very easy to find information about the background of a politician (at least for parents and grandparents), while in Bulgaria it is almost impossible to find information about the background of a large number of politicians especially the ones representing the pro-western right wing politics. The vast majority of journalists and public figures who claim right-wing and pro-western views have studied in the former USSR and have heavy communist background, not to mention that some of them were snitches of the Communist State Security. In places like Bulgarian Ministry of Defense, Interior Ministry or the National Security Agency the percentage of people working there connected to the former Communist Party approaches 100%. Most of the elder employees there have graduated Soviet schools or have specialized there. The younger ones have been hired by passing phony contests where the winners are known in advance. All this is happening at a time of unprecedentedly strained relations between Russia and NATO. It is no secret for the Western world that quite a few of these people are loyal to Putin and Russia. On the 1st of January 2007 Bulgaria became a full member of the European Union and obtained access to the European Union funds. The fees for membership in the EU are paid by Bulgarian taxpayers. According to The Guardian, in 2010 Bulgaria had paid €346.07 million in fees and received €1107 million. However, it is hard to tell, what the money from the EU was spent for. Our country has the worst infrastructure in the EU (shocking difference between the roads in Romania and Bulgaria). For the regular Bulgarian it is very hard to find any information how she or he can benefit from these European programs although huge amounts of money was awarded to certain Bulgarian medias for that reason. For the most of us it is no secret that the firms receiving money from the EU funds are connected to the people in the Bulgarian government, who in turn are connected to the former Communist Party and its secret services. We were also wondering how the Jewish community was going to react if after the WW2 Germany was run by former Nazis or their sons and daughters. Is there anyone who believes that the Communists have cause less evil to mankind than the Nazis? According to some calculations victims of communism are nearly 100 million. Only in Ukraine in 1932 and 1933 between 3 and 7 million Ukrainians died because of the communists. We are very interested in what way the communists are better than Nazis?! 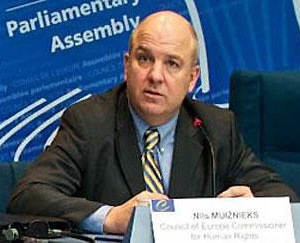 This internet petition is addressed to the Nils Muižnieks - Commissioner for Human Rights to the European Commission. A copy thereof will be sent to the US State Department. If you support our cause we will appreciate if you like and share this petition in Facebook. We thank you in advance.